- Publisher Many of Isaiah's writings have been called "the fifth Gospel." The New Testament contains no fewer than 66 direct quotes from Isaiah, and 20 of the New Testament books include his timeless words. In Jesus' first formal appearance in His hometown synagogue at Nazareth, He captivated the speechless congregation by reading from Isaiah. But it was more than the mere reading, of course. Jesus claimed that the words He read from Isaiah were literally being fulfilled in Him, the Messiah. Indeed, the Book of Isaiah is replete with predictions of both the first and second comings of Christ. And it was Isaiah who made clear (in chapter 53) that the Messiah would be a largely rejected suffering Servant, shattering the time-honored hopes of Israel that His primary function would be to rescue His people from their political oppressors. But the glorious news the prophet proclaimed was that this Servant's stripes and shed blood would provide healing and atonement for our sin. Through his proclamations of the gravity of sin, the righteous requirements of a holy God, and the sure hope of the coming Messiah, Isaiah provides a message of incredible hope for people of all ages. This second part of Wisdom of the Word's study on Isaiah examines chapters 40 through 66 of this inimitable book. 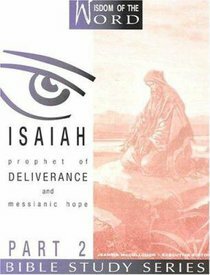 About "Isaiah Part 2 - Prophet of Deliverance and Messianic Hope (#07 in Wisdom Of The Word Series)"
Many of Isaiah's writings have been called "the fifth Gospel." The New Testament contains no fewer than 66 direct quotes from Isaiah, and 20 of the New Testament books include his timeless words. In Jesus' first formal appearance in His hometown synagogue at Nazareth, He captivated the speechless congregation by reading from Isaiah. But it was more than the mere reading, of course. Jesus claimed that the words He read from Isaiah were literally being fulfilled in Him, the Messiah. Indeed, the Book of Isaiah is replete with predictions of both the first and second comings of Christ. And it was Isaiah who made clear (in chapter 53) that the Messiah would be a largely rejected suffering Servant, shattering the time-honored hopes of Israel that His primary function would be to rescue His people from their political oppressors. But the glorious news the prophet proclaimed was that this Servant's stripes and shed blood would provide healing and atonement for our sin. Through his proclamations of the gravity of sin, the righteous requirements of a holy God, and the sure hope of the coming Messiah, Isaiah provides a message of incredible hope for people of all ages. This second part of Wisdom of the Word's study on Isaiah examines chapters 40 through 66 of this inimitable book.